KYEKYEKU & GHANALOGUE HIGHLIFE / GHANA. Highlife – Afrobeat – Palmwine Blues. 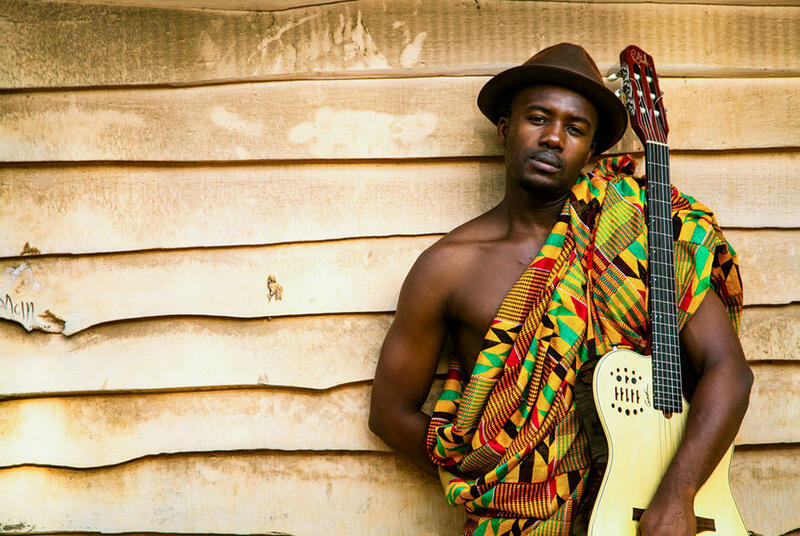 Kyekyeku (Tche-Tche-Kou), a ‘wizard with the guitar’ is from a new generation of Ghanaian musicians who makes the distant past meet contemporary idioms of West Africa’s big musical heritage. His music draws from the forest folk Palmwine blues and the cross rhythms of Ghana that gave birth to some of the unique styles to have come out of Africa south of the Sahara. Kyekyeku creates a unique a high-energy sound mixed in with Highlife and Afrofunk of fellow countrymen Ebo Taylor and Pat Thomas erupting in an exciting Afro-urban beat. With lyrics reminiscent of village recreational songs, protest songs, love poetry and old African spirituality, his music touches on themes concerned with the well-being of Africa and the world society. Kyekyeku - Highlife – Afrobeat – Palmwine Blues.